In the following I will give a short introduction to The Human Design System (HDS), followed by six longer comments, where I describe the different kinds of New Age manipulation-tools used in the system. Though the comments relate to HDS, then they are formed as a general critique of these manipulation-tools as such (also see my article Six common traits of New Age that distort spirituality). HDS is said to be a tool – a system - which you can use, if you want. It is based on old “sciences” such as Kabbala, astrology, and I Ching, which are combined in new ways, and connected to new knowledge within Quantum Physics and genetics. The creator – or rather “The Receiver” of HDS is Alan Robert Krakower. He was born in Montreal, Canada, April 9, 1948. He lived on Ibiza under the name Ra Uru Hu, until his death in 2011. He was a well-educated and successful businessman, who worked as a contractor and magazine publisher with own advertising agency. After this he gave up his wealth and worked as an artist, poet, musician and composer. On Ibiza in 1987 he experienced an extrasensory intelligence, which he calls “The Voice.” During eight days and nights he was taught about the mechanical and spiritual structure of the Universe. Immense knowledge and countless details was channeled to him. The experience was shaking him. Previous he had been arrogant and strongly self-centered. But after the experience he became humble and he created HDS, which, according to him, can replace all old systems. Ra says, that HDS not is here because of him, but because of a supernova in 1987. Mankind was influenced by the neutrino stream from this supernova – precisely in the eight days and nights, where he received the informations about HDS. It was by the way the first time a supernova could be watched with the naked eye. It took place in Chile on the clear nightsky. Neutrinos are some strange particles, which have almost no mass, and which travel thousands of light years through space. They move easily through almost everything – you, me, the earth. Their origin is supernovas (dying/exploding suns) and black holes in the universe. HDS takes it basis in the way the neutrino stream influences our genes on the time of our birth, and on the 88th day before – the day where the soul – according to HDS – goes into the body. This influence creates the energetical background for, how your personal HDS design chart looks like. The design from which everything are interpretated. It is your genetic blueprint, created by the neutrinos on the day of your birth, combined with the situation 88 days before. HDS is a complex system of types, definitions, profiles, lines and gates, and their connections in between create a detailed model of you and your purpose in life. According to Ra, then every human being has a unique archetypical nature, which has to be investigated and expressed. Not by doing something, but by being yourself. With HDS you will get better in making decisions, because you live in accordance with your design – your true nature. HDS is in that way a tool to find your inner authority – and your strategy of life. To know your lifestrategy and inner authority is the same as knowing which type you are. HDS works with four human types: Generators, manifestors, projectors and reflectors. The solutions to such problems require a communicative reason, a reason, which understands the human community. But as Habermas says, then we are not using such a reason, on the contrary we are using an instrumental reason on human problems, where it only should be used on technical problems. We seek to solve human problems technically, where they should be solved in a philosophical way. The systems (the market, the economy, the bureaucracy, the systems) have colonized the lifeworld. An aspect of, that the instrumental reason has conquered territory from the communicative reason consists in, that we in connection with human problems treat each other as means or as items, which have come on the wrong course (the treatment society). It is interesting, that the New Age movement, which actually should be a spiritual alternative to this, and be an advocate for a communicative reason, on the contrary is one of the most aggressive advocates for the instrumental reason. This is due to its psychologizing of philosophy. New Age is possessed with all kind of self-invented forms of treatment, and with pseudoscientifical attempts to justify them as science. Often they manipulative use instrumental/scientifical inspired terms about their methods, but which are without any scientifical meaning at all. It is just a rhetorical trick to persuade people to pay the fee. It is also interesting to compare this characteristic trait of New Age with Aldous Huxley´s novel Brave New World (notice the similarities in the titles). This novel foresees the end of democracy in a pseudoscientifical, technological fixated meritocracy. The novel is precisely about a totalitarian state, which keeps psychological and genetic control with everybody, so that they surrender to the claimed “blessings” of the progress of the instrumental or technical reason. Everything, also humans, and human problems, are treated instrumental or technical. Psychology and genetics are controlling people down to the smallest details, children are being born and “growed” on bottles, brains are being trimmed, characters are being converted after the needs of the dominant state. Notice the similarities with the New Age product called Neuro-linguistic Programming (NLP), which are about programming your brain so that you can become a success in society; that is: so that you work in favour of Consumer Capitalism (see my article Neuro-linguistic Programming (NLP), and Large Group Awareness Training (LGAT)). And notice the similarties with The Human Design System. HDS purely and simply claims that it is not a belief-system, but a new science. Though it admits, that not everything about it can be proven, then HDS claims, that the veracity of the system itself is currently being tested. Statistical research has substantiated the reliability of the chart itself. Statistical studies of various populations show the system to be reliable in grouping people according to four different basic types. HDS claims the following: There are two avenues of experimentation now taking place: objective and empirical. Objective validation is in progress through statistical and clinical work - empirical validation is in progress through the thousands of people around the world who are experimenting with their strategy and with the information about their own personal designs and that of others they know. So far the feedback has been that the system delivers much detailed information that is uncannily accurate and useful. As with other New Age directions, there in HDS seems to have gone inflation in the thought distortion Research has shown that… A phrase, which often is used to convince the listener about, that the one who talks can reason what he says with concrete empirical proof. But this is often just an example of subjective argumentation, a kind of unethical manipulation (often based on wishful thinking), because it is extremely vague to claim that ”research has shown” anything, unless you can reason the assertion with specific details about the claimed research. Who has carried out this research? Which methods were there used? What exactly did they found out? Have their results been confirmed by others who work within the area? The thought distortion Research has shown that…is extremely widely spread within the New Age environment, where concepts such as research and science all too often are being mixed with spiritual concepts. An example of the lack of ability to understand oneself as philosophy/religion, and not science. Let me make one thing clear: there is nothing whatever in HDS that has been supported by science, and it is not going to happen either, because of the problems I will show in the following. The massive talk about science within HDS, and the use of scientifically sounding concepts, are, as in other New Age directions, used for manipulation. The so-called “research” within HDS is, as with other New Age directions, based on testimonials, which nothing has to do with a scientifical investigation. I will return to this. HDS contains two kinds of pseudoscience, namely the demand for “alternative” sciences within New Age pseudoscience, and the pseudoscience of reductionism (read in detail about these pseudosciences in my articles The pseudoscience of New Age and reductionism, and The pseudoscience of reductionism and the problem of mind). HDS claims to gather knowledge from the wisdomtraditions. I wonder if they know the Buddhist philosopher Nagarjuna. He said, that the Now´s lawfulness around the function of the negationpower, is due to, that energy works as streams and dividings within a superior wholeness. And because the wholeness is a reality, each part will always fit into a correspondent part. This means, that each part only can be understood in relation to its negation; that is: what the part not is. Firstly this implies, that each part comes to appear as part of a polarization-pair, or a pair of opposites – like in the teaching of Yin and Yang. Secondly it implies, that each part only can be understood in relation to everything else; that is: in relation to the wholeness. And since everything in this way only work correlative, yes, then Nagarjuna claimed, that we actually nothing can say about the wholeness, only about the parts. Therefore he called the wholeness the Emptiness (´sûnyatâ) – a teaching, which had one quite determinate purpose: the neutralization of all the dogmas, theories and viewpoints, which ignorance has created (read more about Nagarjuna´s argumentation in my article A Critique of Ken Wilber and his Integral Method). This leads to the thought about that human beings have two aspects: an energy aspect and a consciousness aspect. Seen from the energy aspect lawfulness rules: your body is subject to the physical laws of nature, your psychic system is subject to the lawfulness of the energy fields and of the energy transformations. Seen from the consciousness aspect, then a human being seems to be akin to the wholeness, to be transcendent in relation to these lawfulnesses. HDS is reducing everything to the energy aspect. As with a lot of other New Age directions it has no valid understanding of the consciousness aspect, though talking a great deal about it. And it is only the consciousness aspect, which can come to insight about karmacial structures. But, as with other New Age systems, HDS is inspired by Theosophy, and its fascistic theories of evolution seen in connection with the development of consciousness. Fundamental to HDS, is the concept of a binary consciousness, both a mental and a physical consciousness. According to HDS, humans are endowed with two crystals of consciousness, a Design Crystal and a Personality Crystal which both receive and process neutrino information for the healthy functioning of the being. Learning to utilize ”binary consciousness” is, according to HDS, an evolutionary step in the human process that has not been previously available to humanity, according to HDS. Throughout history, consciousness has evolved through the evolution of human design as with the 5-centered Neanderthal (Homo Neanderthalensis) to the 7-centered Homo Sapiens. The 7-centered Homo Sapiens evolution corresponds losely to the model of the 7-centered Hindu Chakra system. In 1781, the mutation to the current model of the 9-centered being began to appear in the population, and completely replaced the 7-centered strategic being by the 1860’s. The potential of the 9-centered being is just at the rudimentary level of understanding, which can develop far beyond the cognitive, sensory and awareness capabilities of the 7-centered being. Humans today still carry the chemistry of the 7-centered being in their cells, and continue to operate in an archaic 7-centered hierarchic social structure and world view, mostly unaware of their expanded potential. According to HDS, the 9-centered being is a transitional form and that a further mutation will begin to appear in the population in 2027 with the emergence of a new species, called The Rave. 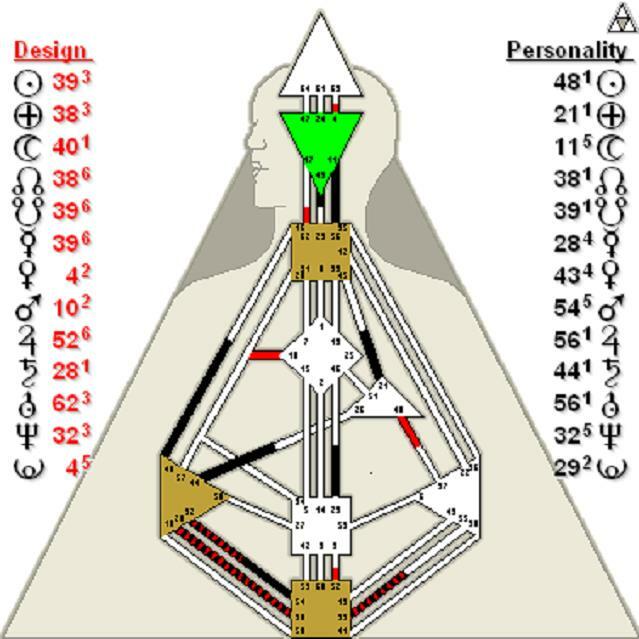 As a transitional form, the current human design of the 9-centered being has consciousness capabilities beyond the scope of the 7-centered ancestral design, and it is this ability to utilize the binary consciousness that differentiates the 9-centered design from it’s past. Note that the HDS design chart also is called a Rave chart. Anyway, these fascistic ideas also confronts HDS with the problem of ideology (read my article The difference between philosophical education and ideological education). Read more about these rising fascistic tendencies in my articles The fascism of Theosophy, A critique of Ken Wilber and his integral method, The pseudoscience of reductionism and the problem of mind, The new feminism and the philosophy of women´s magazines and Time travel and the fascism of the WingMakers Project. Read more about pseudoscience in my article The pseudoscience of New Age and reductionism. HDS claims to be a new way of explaining the concept of karma. So is The Law Of Attraction, but in a way that is in opposition with HDS (see my article The New Thought movement and the law of attraction). Who shall we believe? I believe in the original wisdomtraditions, which I will go into in the following. The problem with the alternative environment within the New Age movement, is that the normal inaccessible areas of the astral plane´s collective history, which in principle lie outside the area of the Ego-consciousness, are open for all sorts of fantasies (see my article Paranormal phenomena seen in connection with spiritual practice). Within the New Age movement there are countless people today, who work egoistic with karmacially experiences – that is to say: they earn money as clairvoyants, regression therapists, astrologers, etc. Some of them live on pure make believe, others are direct frauds, but some of them have actually the ability to see into the astral plane´s collective history, and tell about a past and a future which lies outside the area of the personality. But usually they have no philosophical training, no realization training and ethical practice. Therefore they basically do not know what they are doing. They are lost in the area of time where mountains no longer are mountains, and woods no longer are woods (I will explain this in comment six). There is in this area of the astral plane´s collective history, with all its experts and clients, the possibility for a lot of waffle, a lot of imprecisely guesses and imagination, fiction and speculation. There are therefore some philosophical principles you ought to hold on to, on the whole of this enourmous, and growing market. The so-called compensatory karma will by these experts and clients normal be misunderstood and abused as a kind of legitimation of, that we are as we are or do, as we do. He or she becomes obliged to do this or that, in order to equalize old karma (HDS is using other words, but is doing the same mistake). This is spiritual seen nonsense. Usually the whole thing is about escaping from reality or excuses. Another philosophical principle is to examine, whether the karmacially talk and experiences of the experts and clients remove their energy-investments in the actual reality. If focus is displaced backwards or forwards in time, then the collective time has taken over and spiritual seen there therefore happens an escape. Such an escape is seen both in Freud, Rank, Grof, Janov, rebirthing, regression, clairvoyance, past (or future) lifes therapy, astrology, prophecy, shamanism – and in HDS. None of these people and theories can therefore be said to work spiritual. And if they use the karma idea in that way, it is no longer a spiritual help, it is a collective displacement of the focus backwards or forwards in time and therewith out of reality and into the unreality of the astral plane´s collective time (see my articles A Critique of Stanislav Grof and Holotropic Breathwork and Regression psychotherapies). Only Man himself can find the progressive karma. It is only the consciousness aspect of a human being, that has the key (HDS: chart) in its life. It helps nothing, what HDS may be able to see in the astral plane´s collective history, or fantasize about another person´s karmacially experiences. Many of these experiences (for example about past lifes) – and which have a certain reality for either the clairvoyant/astrologer/HDS consultant, or the client – are collective fantasies. Collective fantasies have two aspects. The one aspect of the fantasies is a kind of archetypical, mythologically symbolizings of more personally, unclarified matter. The second aspect of the fantasies is relatively valid information about incidents, for example in other centuries. The misguiding happens because the two aspects are blended together. The clairvoyant/HDS consultant, or the client himself, can remember, that he has lived in a past incarnation (often very romantic, for example as a pharaoh), and he can even travel to the places, where he had been incarnated and find things which ”proves” his assertion. There has been made many examinations of things of that kind. But regardless how fascinating it is, then it proves nothing about past lifes. And therefore it is deceptive and dangerous to occupy oneself with. Nobody can tell you about your karmacially structures. All people - clairvoyants, regression therapists, shamans – and HDS consultants - who are claiming they can help you karmacial, are cognitional and ethical delusional and deceptive. The genuine karmacially structures do not lie in the astral plane´s collective history, that works in sequences in past and future, but in the universal history of the astral plane, which work in synchronism with the Now. And the Now is a quality of awareness; that is: consciousness. Only by being aware you can find your karmacial structures. If the karma idea is used spiritual seen correct, then the focus, instead of being projected out in something afar (past lifes, a system, birth, the future), will be present in something very near, namely only in the most intensive experiences of this actual life, and after that: in this actual Now with its possibility of realizing your innermost. Also see my article What is karma? For a longer examination, read my article A Map of the Spiritual Journey in my book Dream Yoga. Channeling is a process whereby an individual (the ”channeler”) claims to have been invaded by a spirit entity, which speaks through the channeler. There are many non-enlightened New Age teachers today – (they might very well have strange paranormal abilities, it doesn´t matter in this question) – who get authority by claiming, that their teaching is being channeled from some kind of divine source. If such teachers put their teaching forward in this way, you can be hundred procent sure, that this teacher has a problem with ego-inflation (if he is not directly a fraud -and them there are thousands of within New Age). Why? Because no real enlightened master would argue in this way. True enlightened masters speak from their own source, and are always characterized by humility. Just look at Dalai Lama, who incessantly claims, that he hasn´t reached the full Rigpa, and that he is just a beginner. True enlightened masters are also always philosophers, who are giving reasons and presenting arguments to support conclusions. Generally it is, in connection with channeling, good to have knowledge about the thought distortion called Truth by Authority, which is about taking statements to be true simply because an alleged authority (experts, teachers, divine sources, paranormal abilities, - a “Voice”) on the matter has said/justified that they are true. A level of critical thinking is always appropriate, because the statement may be based on magical thinking, false premises, faulty reasoning, wishful thinking or vested interests (see my book A Dictionary of thought distortions). People, who in their arguments/teaching, again and again, have to defer to some authority (experts, teachers, divine sources, paranormal abilities) in order to justify their arguments/teaching, are hundred procent on the wrong track, even if they should have some paranormal abilities. Again it is interesting to see, that true enlightened masters never do this. And interesting, that probably most of the many people, who have made a business on being clairvoyant/mediums/channelers etc., will fall for Truth by Authority. Read more about channeling in my article Paranormal phenomena seen in connection with channeling. There exists several different kinds of personality typing, and there are still coming more. The many different kinds of personality typologies are now so huge, that it is beginning to get comically (who shall we believe?). Each new number of a New Age magazine with respect for itself, must include at least one new “revolutionary” theory of personality types, in the same way as it must present at least one new “revolutionary” spiritual theory “proved” by quantum physics. As mentioned, then the so-called “scientifical” research within New Age, often is based on testimonials. Theories of personality types can for example point to many “successes.” They can demonstrate that their programs “work”. They can bring forth to testify on their behalf hundreds, if not thousands, of satisfied customers. But it is important to know, that testimonials do not validate a self-help program. Scientifical seen this is pure nonsense, and deeply manipulative. All talk about that testimonials are a proof, is a sign of pseudoscience. Furthermore, the sense of improvement, for instance peak experiences, might not be matched by improved behavior. Just because they feel they have benefited doesn´t mean they have. Often they simply have become a nuisance for their non-initiated surroundings. Why? There is no evidence for personality typing at all. How do we test these kinds of claims? We cant. The philosopher Paul Ricoeur has referred to the “hermeneutics of suspicion” encouraged by writers such as Marx, Nietzsche and Freud. What people think, and the reasons they produce, may not be the real reasons at work. It then becomes easy to become suspicious of the motives of everyone, whether as the representative of an economic class, or the purveyor of a morality, or just as an individual with psychological problems to solve. And when a therapists or a coach - as it is the case most of the time - is lacking the ability of thinking deeper over things, then it ends in being a refined way of justifying prejudice. Personality typing is simply a way of creating a system of prejudice. And that is anti-spiritual. But theories of personality typing do the opposite. They try to remove rationality and critical thinking through the hermeneutic of suspicion. And they have succes. A whole time-tendency within school, folk high school, universities and continuing education, focus on so-called ”personal development”, which are inspired by them. Everytime you have a personal problem you will begin to think in the ways the personality typing system has taught you to think, and you will begin to consider if you ought to get help (use money) from a consultant in precisely this system (more about the existence-philosophical problem later). Notice that HDS actually claims that statistical studies of various populations show the system to be reliable in grouping people according to four different basic types. Have HDS not learned anything by studying the catastrophical human consequences of the Indian caste system, which precisely is about grouping people according to four different basic types? Read more about personality typing in my article Personality typing is a refined system of prejudice. As an advocate of a communicative view of Man and nature, I am not in doubt about, that the parts within the wholeness are influencing each other. There are both ancient Chinese versions of astrology, as well as Tibetan versions, that I can see no reason to doubt the value of, when practised by a competent master. And the question about competence leads to my critique of astrology. In its psychologized form, astrology is a type of New Age therapy used for self-understanding and personality analysis (astrotherapy). The danger of this is the same as the danger of clairvoyance (see my article Paranormal phenomena seen in connection with clairvoyance). The word horoscope comes from the Greek words Hora, which means time, and Skopein, which means investigate, and in this also lies the danger; the danger of loosing yourself in time. Rather than helping clients to become stronger and more independent, it can induce in the client an abdiction of responsibility and a state of sickly dependence on the astrologer (or The Human Design System). As already said: the so-called compensatory karma will by these experts and clients normal be misunderstood and abused as a kind of legitimation of, that we are as we are or do, as we do. He or she becomes obliged to do this or that, in order to equalize old karma. This is spiritual seen nonsense. Usually the whole thing is about escaping from reality or excuses. And let me repeat: a good philosophical principle is to examine, whether the karmacially talk and experiences of the experts and clients remove their energy-investments in the actual reality. If focus is displaced backwards or forwards in time, then the collective time has taken over and spiritual seen there therefore happens an escape. Only Man himself can find the progressive karma. The consciousness has the key in its life. It helps nothing, what astrologers may be able to see in the collective time, or fantasize about another person´s karmacially experiences. Many of these experiences (for example about past lifes) – and which have a certain reality for either the astrologer or the client – are collective fantasies. Nobody, and nothing, can tell you about your karmacially structures. All people - clairvoyants, regression therapists, shamans, astrologers, HDS etc. etc., (and tools, as for example horoscopes, personality maps, etc., etc. ), - who are claiming they can help you karmacial, are cognitional and ethical delusional and deceptive. Only your own realization opens. Whether another person even was able to read the whole of the karmacially course and tell the seeker about it, it would not help. On the contrary it would harm (I will return to how it will harm in comment six). Only your own inner experience and realization can open the spiritual dimension. Karma in other ways is nonsense. And by the way, that´s the same with all spiritual. The genuine karmacially structures do not lie in the collective time, but in the universal time, which work in synchronism with the Now; that is: with the consciousness, which is a quality of the Now. If the karma idea is used spiritual seen correct, then the focus, instead of being projected out in something afar (past lifes, birth, the future), will be present in something very near, namely only in the most intensive experiences of this actual life, and after that: in this actual Now with its possibility of realizing your innermost. And again: In all briefness you can say, that genuine spiritual counseling tries to guide people, who wish to learn, to go round the states, which have to do with the collective time, or at least, to shorten the passage through these areas. And if you are lost in them, to lead you back on the right track. The name Newspeak is the name George Orwell gave the language, which the rulers in his dystopian novel 1984, had created. The intention with it was to control thinking, to make some ideas impossible to think, including concepts such as good and evil, true and false, beautiful and ugly. In this connection they used concepts such as Old thinking and New thinking, so that people get a feeling of guilt, everytime they use concepts within Old thinking . Today, after having passed 1984, we live in a so-called postmodernistic dystopia, where eternal values such as goodness, truth and beauty fall more and more away – and where we have been invaded by the ideology of relativism, which rulers, in creeping ways, use the same phrases as the rulers in Orwell´s novel, as if they had used it as inspiration (see my article The Sokal Hoax). 2) The claim, that Quantum mechanics and Einstein´s theories of relativity prove that classical physics (the age of enlightenment, rationality, objectivity) is not valid anymore. Therefore they demand that science has to be integrated with alternative sciences (and alternative views of human rights); what I call the Illuminati aspect of the Matrix Conspiracy, because science can´t be mixed with spiritual or political concepts. If this happens, then it is not science anymore. The same thing with relativistic and subjectivistic views of human rights; then it is not human rights anymore (see my articles The Matrix Conspiracy and The new feminism and the philosophy of women´s magazines). And, in short: New Age systems, and all relativistic theories as such, are actually themselves using classical physics to explain their own theories (for example by the help of the causality-principle), and that is precisely what quantum mechanics breaks with. Read more about this in my articles Quantum mysticism and its web of lies, and Quantum Mechanics and the philosophy of Niels Bohr). I will explain Thomas Kuhn in relation to how he is abused in NLP (read about NLP in my article Neuro-linguistic Programming (NLP), and Large Group Awareness Training (LGAT)). But the use of the concept of paradigm shifts is very popular within New Age, where a constant stream of new (revolutionary) systems (New thinking), often contradictory, are claiming, that it from now on is impossible to think in “old” ways anymore, without accepting their systems. The failure is due to their constructivistic ways of thinking; that is: relativism and subjectivism (read more about paradigm shifts and constructivism in my article Constructivism: the postmodern intellectualism behind New Age and the self-help industry). Finally HDS is called the “science” of awakening. It is also called The Tao of HDS, and some are using Zen to explain it, for example that it is a new kind of Zen. If you actually follow HDS, then you, in your opinion formation and identity formation, will strive after being something else than what you are, you are imitating others (the system), are a slave of others´ ideas and ideals (the personality types), and your actions will therefore be characterized by irresoluteness and doubt. Directly opposite to what HDS itself claims. Tao, Zen and the existential-philosophical claim about being yourself are the last things you can combine with an instrumentally, technological fixated system as HDS. Have these people not studied these traditions? These traditions are directly a rebellion against any kind of authority and system. The father of existentialism, Søren Kierkegaard, would have turned in his grave if he had heard about that HDS is about being yourself. This structure is also called the astral plane, the astral world, or the Akashic Records. The Akashic records are the wholeness, and as mentioned: the wholeness can be in three states of spiritual awakening - sleep, dream, awake – which again can be described as the personal, collective and universal time (or history). The astral plane´s collective history is a very dangerous intermediate area, if you not are very trained in realization and compassion. And especially when you are working in accordance with a system it is a dangerous area. The temptation to here, either to become afraid, or to experiment with various possibilities (astral travels, clairvoyance, telepathy etc. etc.) is great. It is a very forceful state. Goethe and Dante write about the collective time in ”Faust” and in ”The Divine Comedy”. Tolkien writes about it in ” The Lord of the Rings”, Ursula Le Guin in ”The Wizard Ged”. The shamans had to dare the journey to the underground kingdoms with their shadow-inhabitants, demons and dead. And they had to handle the journey to the heavenly regions, where gods and goddesses, heros and heroines, accomodated. The mystics had to experience the descent to hell with its belonging devils, fire and sulphur and torment and suffering. And they had to handle get off to heavenly hosts of angels and light-creatures, if the temptation was as difficult to resist as the sexual impact of the devil. The creativity, and the reality-creating ability, is in the astral plane´s collective time set free in fascinating degree. However you are, in this astral state, still on the plane of the collective images of time, which work in sequences in past and future, and you are in danger ending up in a spiritual crisis (see my article Spiritual Crises as the cause of paranormal phenomena). A spiritual crisis is an expression of, that you have gone out in the collective time with your Ego, without having done the philosophical preliminary work; that is to say: the realization-work and the ethical training. You are not sufficiently awake on this area. The Ego will then make you loose your way in the collective time. 1) If the borders to the collective time is broken down or being exceeded out of hand, for example through LSD or through one-sided development techniques, or in shock, the consciousness and the personality will slide crucial out of balance and therefore suffer. The Ego will sideways with its personal identity and lifesituation, suddenly experience break in of tremendous astral energies, clairvoyant abilities, visions of mythological beings, good and evil forces, various demons and angels, death and themes of rebirth, unusual light phenomenons, messages from supernatural beings, memories from past lifes. These experiences will, because that the Ego´s nature has not been realized, be characterized by unreality and division, anxiety of going mad and anxiety of death, or the experience of a total meaningless and dark extinct world. 2) The personality can receive informations through the break in of astral and collective energies, images and symbols: information about, what approaches human beings from outside (from other people, from chance, destiny, life etc.). However informations through collective images are contradictional and split. Many have therefore been seduced by these colourful experiences and have remained there, with the ability to see the aura, with the ability to create images, to create in reality. When the astral plane´s collective time is used spiritual in genuine sense, then the Ego, in its egoistic isolating and self-affirmative function, steps aside. However the same forces can be used for other intensions. It can be creative, Ego-affirmative, political, demonical and so on. The forces which in spirituality are given to others´ disposal in healing, energy transmission and spiritual information exchange, the same forces can themselves be turned in through the Ego-structures and open creative channels, create super Egos, create political leaders and popular seducers. The problem, or the danger, does not consist in using creativity or auric abilities. It is actually a good idea to formulate the experiences creatively; the danger is, whether the Ego grows and becomes swollen on the world´s positive responses. And if the Ego gains strength, takes the honour, or blows itself up, the transformationprocess of consciousness stops, the growth forward towards the goal: illumination and later enlightenment (see my article The ego-inflation in the New Age and self-help environment). It is absolutely foolish to claim that a system like HDS directly is a “science” of awakening. How should the HDS system, and HDS consultants (who only have taken a short education), deal with the above mentioned problems of awakening? In my article A critique of Stanislav Grof I more deeply describe the problem of incompetent teachers dealing with non-ordinary states of mind, which they themselves haven´t got any experiences with. Note: Advocates of The Human Design System are some of the most aggressive users of the thought distortion Backfire effect, when confronted with critique, probably because HDS is still new, and that they have invested a lot of money in it. So, before HDS consultants are writing to me with insulting emails, I will advice them to read about the following thought distortions: Backfire effect, Classical conditioning and placebo effects, Ad hominem move, Good intentions bias, Nondual bias, Subjective validation, Illusion of control, That´s judgmental, Don´t knock it till you try it – because these thought distortions typical are involved in their attacks on me. You can read about them in my book A dictionary of thought distortions (free download).